From Roman times to today, an impressive small city with big monuments. Nîmes is the capital of the Gard département in France's Languedoc-Rousillon region, and thus not properly located in Provence. But, located only 32 km (20 miles) northwest of Arles and 45 km (28 miles) southwest of Avignon, it's easy and appropriate for you to include Nîmes in your trip to Provence. 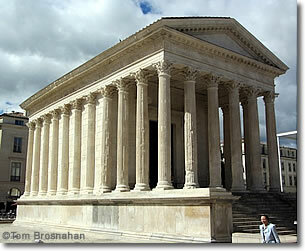 As in so many other cities in rich Roman Provincia (today's Provence), Rome built monumental public buildings in Nîmes. You'll know the Romans thought highly of Nîmeswhen you see Nîmes' Maison Carrée, a pristine white marble temple from the first century AD; the stupendous Amphitheater still in use for spectacles and shows; the Porta Augusta, Porte de France, Temple of Diana and Castellum divisiorum, not to mention the awe-inspiring Pont du Gard aqueduct on the outskirts. You should too. It's a clean, attractive city with a somewhat more noble aspect than that of its also-attractive neighbors. It's not just the cool, shady Jardins de la Fontaine, the site of the spring that drew the original settlers, and Les Quais de la Fontaine, the tranquil waterway that carries the water. La Maison Carrée marble Roman temple, Nîmes.